A client had come into my shop and wanted to buy my Stanley jig. I have had the jig for so many years that it would have pained me to let it go…Him being a good spirit and having come over to the side of beautiful and functional tools, this is what I built for him. Always after a project, whatever size, one sees the small imperfections. I still try to come to terms with that. This looks better than the original, nice touch, plus the warm feeling of wood. Love those finger joints. Is the wood Koa? That is the cat’s meow!! WOW! Now that is a sharpening jig. Simply beautiful and I agree – better than the original. 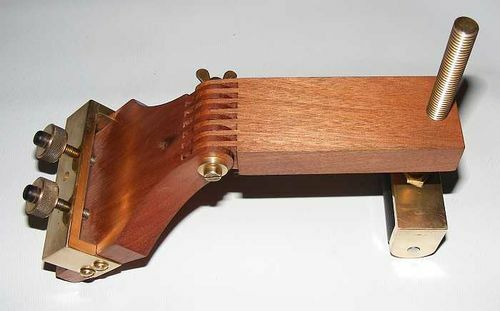 I don’t even know what a sharpening jig looks like (until now), let alone how to build one. Nice work. Hello Rock. I have a workshop full of odds and ends, pieces of unidentified hardwoods I have forgotten where I got from. This one (as yet unidentified) took a beautiful thread and was hard and cut cleanly, so into the tool it went! Thanks for the compliments, always appreciated. Great looking jig! I like it better than the original—more character in your jig. oh that is sweet looking. What’s the roller assembly ?? did you make it or find it as a part? Hello woodchucker. 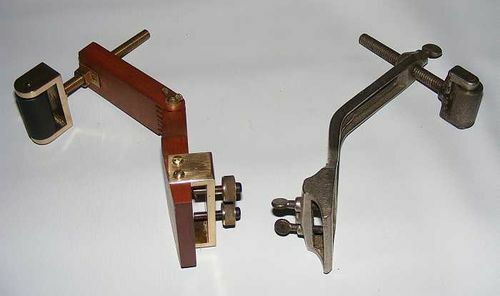 The roller assembly is 6mmx25mm brass stock. The roller is a black nylon with a stainless shaft. I fixed the shaft in position with an e-clip which lies between the roller and the brass frame. Gorgeous! What are the rough dimensions, don’t have an original, but would love to make one? Hello Revrok, thanks for the interest. Dimensions are all in mm. 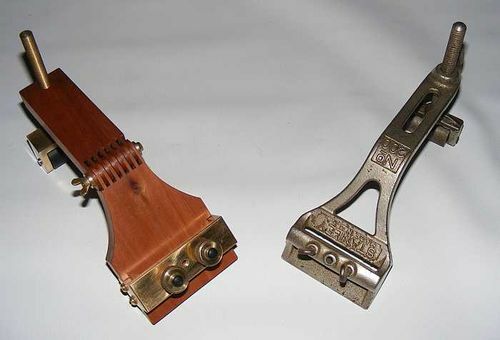 Overall length 225, width at blade-holder 84, Knuckle is as close to dammit halfway, space between brass overhead clamp and wood is 10, width of neck and tail 40, thickness of wood is 19. 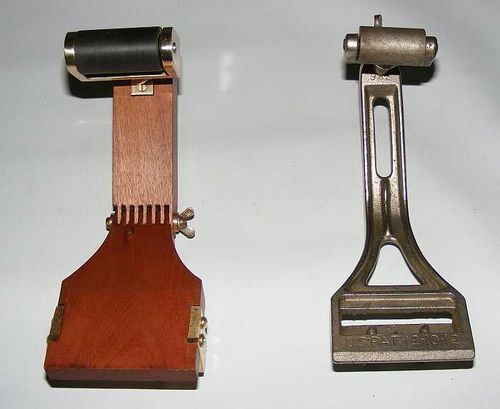 Length of brass threaded rod is 115 and finally, the width of the roller itself is 47. Phew! I rarely plan but rather develop as I go along. Hope this helps you. Very Nice Work Indeed! Thanks For all of The Details & Sharing! Very nice. I will have to add that to my to do list. How to look good while sharpening. Nice. Toolchap… Thanks! Great detail and congrats again on a beautiful tool.